"I lived on the porch of Rectory/Holy Trinity Cathedral for almost 5 months. after homelessness… really hit Home, so to speak. I thought it was very well done! It has inspired me to try to help the Street People I met while I was outside. I was never homeless while at Trinity. Many thanx for an excellent play." "after homelessness… may be the most important show you can seen this year." 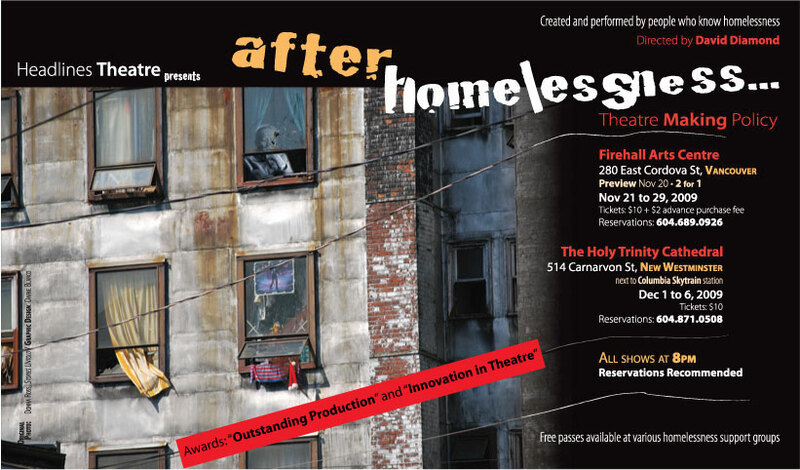 after homelessness… webcast was broadcast live to the world wide web on Sunday Nov. 29, 2009, from Firehall Arts Centre in Vancouver. Thanks to everyone who logged on, watched live and participated with your unique interventions. Does Metro Vancouver need a theatre project that rings an alarm bell about homelessness? Absolutely not. Headlines Theatre is in collaboration with people who have been homeless and various agencies working on the issue to create an interactive Forum Theatre project. after homelessness… will ask questions about what it takes to create housing that is safe, appropriately supported and affordable, in the context of having been homeless and the mental health issues that are often attached. A Community Action Report, generated from the interactive Forums, will suggest policies that will be received and considered by Government and Agencies. "Some of the most profound moments I have ever experienced in theatre occurred during this performance (after homelessness…) Don't go if you want to feel comfortable and secure in your life. It is only for those who want to feel hopeful, uncertain, aware, responsible, angry - in other words, connected." "after Homelessness… was gripping, while excruciating. One couldn't help but think, 'How can I know this and not act to help?' The acting was intense, as most of these performers had intimate experience of homelessness in some respect. The humanity of the homeless characters was authentic. This theatre piece did not just entertain. It sent the audience out with a mission: to engage others in dialogue about homelessness, to advocate for homeless people, and to demand government action on homelessness… There is no more noble goal for theatre than that it change people's lives. In the case of after homelessness… change occurred, not only in the lives of the audience, but, hopefully, in the lives of many homeless people."